Pat Cottrell did his best impersonation of James Taylor at the One Pelham East last Thursday, as he filled the air with covers of the folk legend. Cottrell sounds exactly like Taylor. He has been playing music since he was 17, yet has not done covers his whole career. In the late 1980s, he was in the popular local band the Philters. The Philters, not to be confused with the current pop power band out of Florida, were runners up in the 1989 WBRU Rock Hunt. The Philters did release a few cassettes and 45s. 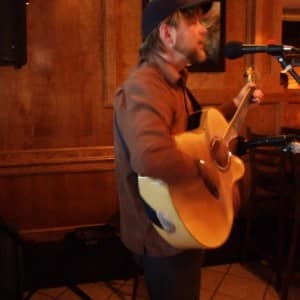 Currently, Cottrell plays mostly bar room classics and top 40 covers and always gets the crowd involved by personalizing the songs. Cottrell also brings playing covers to a whole new level. Instead of stopping between most songs, he plays into them, blending intros and outros, and it works. Pat plays with two microphones and an acoustic guitar, and rocks it well. Catch Pat again at One Pelham East!